Deep Learning, Natural Language Processing, Image and video processing are different areas of great interest to academics and industry professionals. The areas of application of these disciplines range widely, encompassing fields such as text processing, medicine, robotics, industrial inspection, security and surveillance. In this age of information, many online businesses are built on the creation, modification, transformation, use, and reuse of information. Many online sources provide means for use of their data via APIs from which one needs to extract information. Web scraping is gathering data through any means other than a program interacting with an API or through a human using a web browser. To process the scraped data, some techniques comprising Natural Language Processing (NLP) are applied. Image processing Applications include medical/biological image processing, finger print/face/iris recognition, aerial/satellite image interpretations, inspection/sorting of industrial products etc. Some of the applications of video processing include video games, security and surveillance. National Workshop on "Network Protocols and Programming"
Workshop on "Network Protocols and Programming"
Design of Experiments is the most powerful statistical tool that will provide the most significant information possible with the least amount of work. DOE has gained common acceptance among the researchers of various disciplines. Its cost-effectiveness, greater speed and its ability to reveal design limitations not apparent with the traditional experimental methods make DOE approach more vital in the research field. National Conference on "Drug Discovery and Development: A Focus on Newer Technologies"
Evidence Based Medicine & Clinical Research Conference, organised by Department of Clinical Pharmacology and the Department of Pharmacology, SRM Medical College Hospital & Research Centre. The speakers for the conference will be from premier institutes and pharmaceutical industry who have a vast experience in clinical research. This conference would be a fantastic opportunity to meet and hear the experts share their experiences in clinical research. The Finance Department of Faculty of Management, SRM Institute of Science and Technology, is happy to inform you that we are organizing a MDP on “Challenges for Startups and MSMEs with Special focus on funding”. At a time when the startups and MSMEs are at crossroads due to the twin shocks of demonetization and implementation of GST, the program aims to underline the challenges and highlight the opportunities for the small businesses. It also provides a platform for a detailed discussion from the perspective of small entrepreneurs in terms of the funding problems and brings out the various avenues that can be possibly tapped to do away with the hurdles. Needless to say, that the small businesses are currently hampered by inadequacy of working capital as well as long term funds for proposed expansions. This program aims to facilitate entrepreneurs to fully grasp the financial as well as other issues that may act as impediments for their short term and long term business propositions. Experts from the industry will cover in great detail all the aspects listed above and provide insights into possible solutions for the same. The program will conclude with venture capitalists and angel investors taking part in an interactive discussion with the target participants and enable them to find suitable answers to many questions that have been hither to unanswered. (Fee includes MDP Kit, Lunch and Refreshments). Organised by the Directorate of Alumni Affairs, SRM Institute of Science and Technology, Kattankulathur Campus. Dear Chennai Chapter Members! It's our time to catch up for an Inauguration of our SRM Alumni. Our Honorable Chairman is joining us to grace our occasion. Light up the occasion filled with Fun, Music, Entertainment, Food and Mutual Network with all your presence. Venue: Auditorium, SRM Institue of Science and Technology Vadapalani. Please note: This event is only for Alumni (Families not included). To enrol your presence, Click Here. HOD, Department of Mathematics and Statistics. Assistant Professor, Department of Mathematics and Statistics. Organised by the SRM College of Nursing, SRM Institute of Science and Technology. 7th State Nursing Conference on Nursing Research: The Cornerstone of Quality Patient Care. Time: 8 am to 6 pm. Venue: SRM Medical College Auditorium. Nutrizione’19 is a National level conference which furnishes an abundant opportunity for engendering the learning community and future entrepreneurs to enrich their knowledge on India tradition and functional food as well as to highlight the importance of food safety and health aspects. Nutrizione’19 will bring together leading academics, industry personnel, research scientists and food professionals and address the National concerns in the specific topics in Oral and Poster sessions. It implants attention towards rising progression among Food Scientists and Technologists. Nutrizione’19 is focusing the nutraceuticals in traditional foods and safety aspects of food to render an opportunity to ameliorate the human health and reduce the health care costs and endorse economic growth in rural communities. "Let Food be the medicine and medicine be the Food," as coined by Hippocrates. Organised by the Department of Mathematics, SRM Institute of Science and Technology. A one-day Engineering Mathematics Festival (EMF-2019) was organized on Friday, the 15th February 2019 at Faraday Hall, ESB block, Main campus under the aegis of Sri Ramanujan Mathematics club in the Department of Mathematics, Faculty of Engineering and Technology, SRM Institute of Science and Technology. The function took off with a report on previous activities on Sri Ramanujan Mathematics club given by the secretary of the club, Miss. NityaKumari. The President of the club Dr. A. Govindarajan, Professor and Head, Department of Mathematics welcomed the audience by giving a brief introduction about the origin and growth of Sri Ramanujan Mathematics Club from its inception in the year 1991 till date. He also explained how this club differs from other associations in the Engineering departments by its unique feature. The chief guest of the event Mr S.Naveen Kumar, Co-Founder, CEO, Navsar Engineering International, Chennai was introduced to the audience by the Vice-President of Sri Ramanujan Mathematics Club, Dr V.Srinivasan. The chief guest being an alumnus of the then SRM Engineering College recollected his memories dreading Mathematics as a student and realized how it has now become a part of his career. He was an active member of Sri Ramanujan Mathematics Club during his student days. In his address, the need and use of Mathematics both in profession and daily life was insisted. The guest of honour Dr. R. Rajagopal Director, Directorate of Distance Education, SRM Institute of Science and Technology, felicitated the function and declared the meet open. Entertaining events such as DUMB - C, QUIZ gave the fest more life. The individual events like CROSS-WORD, BRAINSTORM and MATH CORE paved the way for the students to display their individual talent and strength in the field of Mathematics. There were about 200 participants registered from all the leading Engineering and Arts and Science Colleges around Chennai. The event was made a grand success by the enthusiastic participation shown by the students of various Engineering and Arts and Science Colleges. Certificates and prizes were given to the winners in all the events by the President, Vice-President of the club and Professors of the Department of Mathematics during the valedictory function held in the evening. The day-long program came to an end with vote of thanks given by the Joint Secretary, Ms Srishti Agarwal of the club followed by the National Anthem. "4th Annual Rationibus Jure National Moot Court Competition - 2019"
The Moot Proposition is based on Data Protection Law and Private International Law. Interested Institutions are requested to provisionally register their participation through e-mail on or before 20th January 2019 and send their soft copies along with demand draft on or before 25th January 2019 after which they can send us the duly filled registration forms when the team composition has been finalized. State Level Workshop on "Nursing Research: The Cornerstone of Quality Patient Care"
On the 20th February of 2019, the Department of Corporate Secretaryship and Accounting Finance organised a one day workshop titled ‘Investors Awareness on Investment’ for the students of B.Com CS and AF. The aim of this workshop was to give a brief exposure to the students about various investment avenues and financial products and services. The workshop began at 10:00 am with an invocation followed by the lighting of the traditional lamp (kuthu vizhakku). The Head of the Department of Corporate Secretaryship and Accounting Finance, Dr.K.Selvasundaram welcome the gathering. This workshop was presided over by Dr.Sridhar Krishnaswami, the Deputy Dean of Faculty of Science and Humanities, who enlightened around 150 students by his words on Investment. Dr.A.Irin Sutha, Assistant Professor, Department of CS and AF elaborated the theme of this workshop. The main motto of this workshop is new financial institutions, players, instruments and financial products are developed. Indian Stock Exchange activities are growing very fast. Investor’s perception is also changing and they are diverting interest from conventional mode of investments to new instruments and products. There is always a need to create awareness among the investors regarding the financial market and their rights. After the formal welcome, the workshop was handed over to the resource persons for the day. Mr. Kishore Kumar, CEO of Trade Achievers Training Academy Pvt Ltd., talked about how important the need for strategic investment is, with his presentation focusing on how mutual funds work and how the investment should be diversified and handed over to experts instead of experimenting too much. He also added how the need for the trading floor in India is increasing by the day and how his work in that department is important for the financial future of India, which is purely going to be dealt with in derivatives and mutual funds. Mr. Walter Vasanth, ACS, Simpson Group of Companies, presented his views on “What, Where, Who and I”. This section was not only interesting but also informative, with the speaker mixing pop references and movie references to keep his presentation engaging and maintaining the decorum of the dais at the same time. He was very interested in explaining how investment is important for all of the future generations and how the investment should be made in arenas of profit where it would be helpful in the longer term than the short term. He also talked about how, why and where the investments should be made, with preference given on the financial market and its dips and increases. Dr.Padmaja Priyadharshini, Managing Director at M/S Home Plan Guru Civil Consultants Pvt. Ltd., briefed about “Entrepreneurship”. She explained the topic with some current examples and experiences. The sessions went on well. The workshop was conducted smoothly with the help power point presentation adding more value to the talk. It revolved around various topics of grave importance in the field of finance. The topics discussed were mutual funds, regulatory authorities in finance and on investor interest and protection. The afternoon session was taken over by Mr.B.S.Krishnan, Assistant Manager, City Union Bank, Kumbakonam, alumni of this Department. He stressed about various investment schemes in the Banking sector. This session was so interactive. He raised many questions with students. The workshop was quite wholesome, detailed and rendered to exact information that was required by the students at the undergraduate level. The students were actively involved in the discussion and the whole session was very interactive. Mr.S.Sairam, Assistant Professor in Commerce, ended it with the Vote of Thanks. The workshop was co-ordinated by Ms.Saranya Suresh, Mr. Harish, Mr. Sabarish and Ms. Nageeswari under the guidance of Mr. A.P.Sebastian and Mrs. S.Sivakavitha faculty from the department. The workshop aims to highlight the practical avenues and necessity of Investment is defined as accumulating money into an asset with the expectation of capital appreciation, dividends, and / or interest earnings. Venue: Dr.T.P.Ganesan Auditorium Mini Hall-1 SRMIST, KTR. Unnat Bharat Abhiyan is a flagship programme under Ministry of Human Resource Development, Govt. of India. UBA is not just a Government Scheme, but a revolutionary mechanism with the aim of transforming rural India. One of UBA's prime focus area is 'Rural Health'. And that's what SRM Institute of Science & Technology also aimed at on 20th February 2019, by organizing "Medical Camp and Swachhata Rally" at one of the UBA adopted villages, Thenmelpakkam. This is also in line with the series of events planned across SRMIST to commemorate 150th birth anniversary of Mahatma Gandhi. The medical camp was conducted following requests from the community during the recent gram sabha meeting held on 26 January 2019 and results of the baseline household survey that revealed that the community suffer from old-age related ailments, diabetes etc. The morning of 20 February commenced with a rally of enthusiastic students and faculties from NSS, highlighting the importance of cleanliness and “stop using plastics”. This is in keeping with the recent notification from TN Government mandating "ban on one-time use and throw-away plastics” effective 1st January 2019. The rally was flagged off by Dr.A.Sundaram, Dean (Medical), SRMIST. He stressed on the importance of keeping our surroundings clean. The rally was well-received by the villagers and passers-by. Armed with captivating posters and thought-provoking banners, they voiced their cause, gathering support along the way. The rally ended at the Govt Middle School, which was the venue for the Medical camp. Ms. Irene Sambath, UBA Project Associate hosted the event. The function began by observing a two-minute silence tribute for the sad demise of our beloved CRPF jawans who lost their lives in Pulwama terror attack. Welcome address was delivered by Dr.V.Thirumurugan, Associate Director (CL). He mentioned about the UBA activities conducted so far at Thenmelpakkam and other adopted villages. He thanked the dignitaries for gracing the function amidst their busy schedule. Dr.A.Sundaram, Dean (Medical), SRMIST delivered the inaugural address. He stressed the importance of inculcating simple personal hygiene practices in our day-to-day lives, and extend the same cleanliness activities to our society. Thereby, the entire community stays healthy. The audience eagerly awaited to listen to chief guest of the day Mr. M.S.M. Vallavan, Deputy Supt of Police (Vandalur Dicision). He spoke about the martyrs of Pulwama attack and the immense contribution of such personnel who safeguard our motherland from foreign attacks. He also invited one of the school students to stage to speak about this incident. The student was appreciated with a shawl for being up-to-date with current events happening in the country and encouraged teachers to inculcate such reading habits in children. He expressed his happiness when the students sang Tamil Thai Vazthu with full vigor. He threw open a challenge to SRM students among audience to sing Tamil Thai Vazhthu without mistake. One of the students, a Dentist volunteered to sing. His effort won him Rs.5000 from Mr.Vallan. The student donated Rs.4000 to the Assisted Head Mistress of Govt Middle School. The AHM on behalf of the school thanked the student for his generosity and willingness. The key message delivered by Mr.Vallavan to the audience was to wear helmets while driving. He specially mentioned about "Kavalan App", which not only girls but anybody could download it and use on their phones for their safety. He mentioned about its usage and functions. He ended his speech with a promise that he will do his best to render his service to service-minded institutions and to all people. Mr.S.Christopher, Block Education Officer, Kattankulathur in his speech highlighted his own contribution as panchayat leader in village development. He too expressed his condolence for the demise of the jawans and inspired the students with the stories of hardships these jawans face while protecting our country. He welcomed SRM University gesture of engaging with rural community and doing what they can for village upliftment. Mr. T. Elumalai, Ex-President thanked SRM for their commitment and relentless effort to serving his village. He was proud of his people who stand united as one community for any matter that concerns their village. As a token of gesture and gratitude, he presented all dignitaries on stage with a shawl. The UBA team also presented all chief guests with a shawl. Mrs.Chitra, Assistant Head Master proposed the vote of thanks. She presented few requests for SRM Managament, one of which was to establish a 'digital classroom', which will be facilitated as per the Village Development Plan of Thenmelpakkam. The programme ended with distribution of writing pads for students freely donated by NSS team, which had key message about 'Hand Wash' inscribed on it, a gentle reminder to students about keeping their hands clean at all times. The function concluded with National Anthem. Refreshment was served to all present and medical camp was formally commenced. The student volunteers facilitated the medical camp and helped the villagers at each of the check up stands: dental, eye, general checkup, blood sugar testing and medicine dispensing. It was a coordinated effort by all general physicians, dentists, nurses and lab technicians. In a well known quote by Warren Buffet, it is said “someone is sitting in the shade today because someone planted a tree a long time ago”. This is true in today’s scenario as greenery is required to balance the environment. The students and teachers of Government Primary and Higher Secondary School at Nattarasanpattu, Kundrathur block, Kancheepuram, Tamil Nadu put forth a request to SRM Institute of Science & Technology for donation of plants, as there are no shaded trees in their school ground. On 26th February 2019, SRM Institute of Science & Technology organized “Tree Plantation” at Nattarasanpattu Government Primary and Higher Secondary School under the aegis of Unnat Bharat Abhiyan, a flagship programme of Ministry of Human Resource Development, Government of India with aim to accelerate development and growth in villages through participatory and appropriate technologies. A team of 50 enthusiastic NSS student volunteers and staff from Maintenance Department with required equipments, planting materials and manpower visited the schools. A whole day was dedicated to this event as it required levelling the school ground with mud, followed by planting 28 saplings of Albizia saman/rain tree and Peltophorum pterocarpum/yellow flame tree, fencing and watering. Through this participatory process, local residents, students and teachers actively engaged in cleanup of the school ground and tree planting. Under the instructions of Head Master, the students volunteered to form groups and each group pledged to look after and nurture one tree. 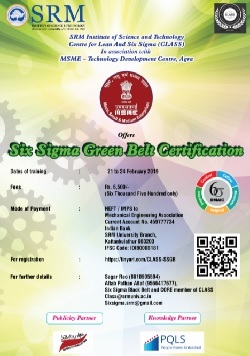 The Centre for Lean And Six Sigma (CLASS), SRM Institute of Science and Technology in association with MSME Technology Development Centre, Agra offers four days Six Sigma Green Belt Certification at SRM Institute of Science and Technology, Kattankulathur. It is time for celebrating the mission Learn, Leap and Lead. As the motto says, SRM IST proudly launched its 8th edition of Research Day on 28th February, 2019. To celebrate the masterminds and to honor the dedication towards innovations, SRM IST has been keen into enlarging the vision of education beyond its assurances. The celebration began with invocation followed by the presidential address given by Honorable Founder Chancellor Dr.T.R.Paarivendhar. He gave a cheering address to the students on the importance of always exploring something more. He insisted that the celebration should remind to every student and faculty member to depart from the regular learning and investigate on new issues to find innovative solutions through research work. He also insisted that the research is a specialized area that keeps the status of the university at the higher level. Joint Director Research, Prof. SRS. Prabaharan presented the important snippets of Research Activities. SRM IST’s research domain is marching towards 10,000 Scopus publications and has reached the recognition as the 3rd world’s best impact factor. He also presented the statistical data about the enormous growth of research works and subsequent publications since its inception. Vice Chancellor Dr. Sandeep Sancheti felicitated the event with his felicitation address. He persuaded the students and faculty members to make sure that something should be contributed to the society as part of research activity. Honorable President, SRM IST, Dr. P. Sathyanarayanan delivered his special address. Research is not exclusive for some particular level of people, it is about creativity, research should be percolating to all the levels of students as well as faculty members and should be inculcated as a culture, said the President during his speech. Prof. Anurag Kumar, Director, Indian Institute of Science, Bangalore, the chief guest gave an inspiration special address. He explained the need for substantial increase in scientific population of the country. He told the importance of striving towards excellence in all the spheres of activities and how that would impact the growth of the country in obtaining innovative solutions. His speech focused on how research studies and inventions should fulfill the country’s requirements. Guest of Honor Dr. S. Guruprasad, Director General –PC&SI, DRDO, New Delhi has given the keynote address. An Expert in Computer Aided Engineering, Dr. S. Guruprasad delivered his keynote address and gave a stimulus presentation on Systematic Approach to Engineering Innovation. He offered very interesting explanation on the domains of science, technology and research. He said science is the founder of engineering and how science has to be deterministic when it is taken to the research level with the help of technology. He also explained on the two types of skills which have to be applied to find optimal solution for engineering problems. He insisted the students to focus on analytical as well as creative skills to find innovative solutions to the complications. Pro VC Planning and Development Dr.T.P.Ganesan, Pro VC Faculty of Science and Humanities Dr.R.Balasubramanian, Dean Medical Dr.A. Sundaram graced the event. The dignitaries gave away the prizes to the winners of best paper presentations.